"..Companies that trust Berde for their building projects include Maynilad Water Services, Mañosa Properties, Arthaland Corp., First Balfour, HT Land Corp., Ayala Land Inc., Filinvest Land Inc., Laguna Lake Development Authority, The Net Group, De La Salle ..."
"..MAJOR retail estate and investment management professional services ... Monocrete Construction Philippines, Aseana Holdings, Keyland Corp., Filinvest Alabang Inc., Cebu Land Masters, Prescon and RSP Lim Construction Co. The first projects to register ..."
"..Arthaland Corp., First Balfour, HT Land Corp., Ayala Land Inc., Filinvest Land Inc., Laguna Lake Development Authority, The Net Group, De La Salle University, Monocrete Construction Philippines, Aseana Holdings, Keyland Corp., Filinvest Alabang Inc., Cebu ..."
"..JLL Philippines Country Head Christophe Vicic said the company has given its full support to have more buildings in major business districts and developments in several parts of the country. Vicic, a member of the Philippine Green Building Council (PHILGBC ..."
"..Berde is the Philippines's national voluntary green building rating system developed by the PHILGBC and has been granted government recognition through the Department of Energy's Philippine Energy Efficiency Program. 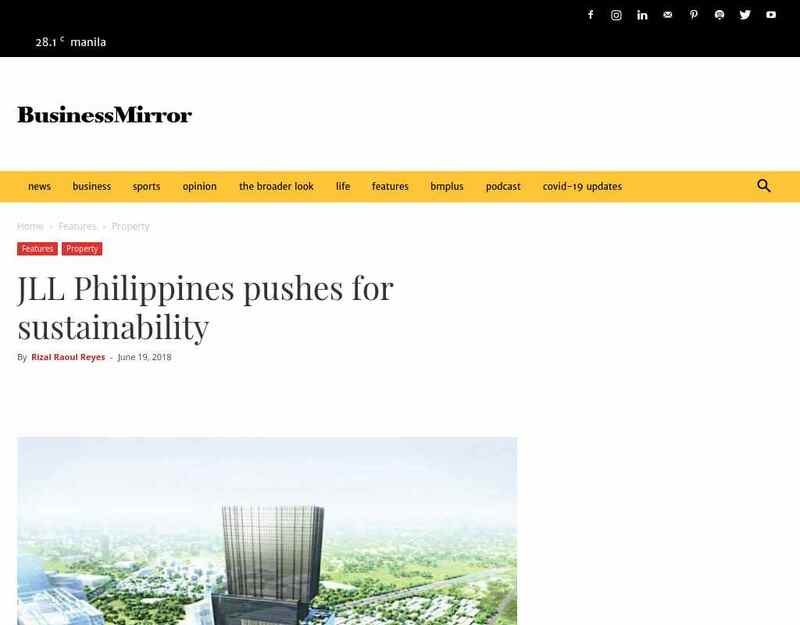 LEED, developed by the United ..."
"..De La Salle University, Monocrete Construction Philippines, Aseana Holdings, Keyland Corp., Filinvest Alabang Inc., Cebu Land Masters, Prescon and RSP Lim Construction Co. The first projects to register under Berde Version 2.0.0 are the Latitude ..."
"..JLL Philippines Country Head Christophe Vicic To prove it also walks the talk, JLL Philippines Country Head Christophe Vicic said the company has given its full support to have more buildings in major business districts and developments in several parts of ..."
"..Vicic, a member of the Philippine Green Building Council (PHILGBC) board of trustees, advocates the implementation of programs to expand green building certifications, such as the Building for Ecologically Responsive Design Excellence (Berde) and the ..."